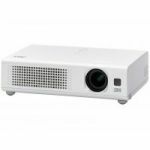 The VPL-FX41 achieves an outstanding brightness of 5200 lumens for dynamic, large-screen presentations, even in high ambient lighting environments. Offering native XGA (1024 x 768) resolution, the VPL-FX41 projects extremely clear and detailed high quality images even on a large screen. 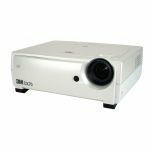 Because the VPL-FX41 adopts a 3LCD projection system, projected images are bright and natural. 3LCD is a projection system using three LCD panels (also known as high-temperature polysilicon or HTPS). This system provides high light transmission and excellent color reproduction. It also provides smooth gradients in dark areas, and even helps prevent color breakup. The VPL-FX41 accepts a wide range of input signals including HDMI, component and composite video, S-Video (Y/C), and computer signals up to UXGA (fV: 60Hz). 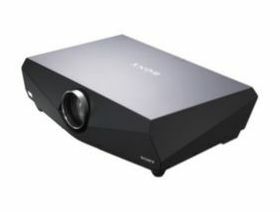 Equipped with 5 BNC connectors, these projectors accept signals from a host of sources as well as support long-distance signal transmission. The VPL-FX41 incorporates 12-Bit 3D Gamma Correction Circuitry to perform highly accurate gamma correction, achieving uniform image color and brightness that extends right to the corners of the screen. What's more, the 3D Digital Comb Filter separates Y signals from C signals with great accuracy, which emphasizes fine images and shape boundaries. The VPL-FX41 is extremely flexible with ceiling, floor, and rear screen installation capabilities. However, the VPLL-1008 can be used for floor installations ONLY. It cannot be installed upside down. The VPL-FX41 can be controlled and monitored via a network. Therefore, the projector status can be verified and simple controls such as powering the unit on or off can be performed. Also, the system can be set up to send automatic email reports to designated recipients for scheduled maintenance, including projected lamp life. Additionally, when the projector is installed on a LAN, presentations can be projected from any PC on that network - whether connected wired or wirelessly. Switching from presenter to presenter is as easy as clicking a mouse - there's no more fussing around with cables. The lamp is accessible from the side of the projector and the filter from the front, so lamp replacement and filter cleaning can be performed quickly and easily without uninstalling the projector. 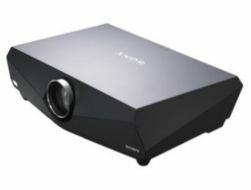 This unique Sony video-enhancing technology incorporated in the VPL-FX41 projector generates high-quality images of outstanding clarity. For interlaced video sources, I/P (Interlace/Progressive) conversion is applied to the signals to project clear and sharp progressive images. When displaying film-originated sources, signals converted by 2-3/2-2 pull down are detected, and each frame of the original film is accurately reproduced. 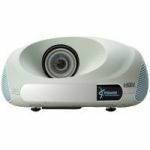 The Zoom, Focus, and Horizontal and Vertical Picture Shift functions available with the projector's supplied power-operated lens and optional lenses (with the exception of the VPLL-1008) can be controlled both from the projector control panel and the supplied Remote Commander™ unit. Images can be easily adjusted to the desired settings both during installation and when the projector is in use. The centered lens provides symmetry for a balanced installation of the VPL-FX41 and makes setup very simple. When applications require double the light output, the VPL-FX41 projector can be twin-stacked. Pictures from the two projectors are then matched using the Picture Shift function on each unit. * The optional VPLL-1008 lens cannot be used when twin stacking. Activating this function allows you to skip standby mode to power on the VPL-FX41 immediately. Direct Power On is ideal for large-scale facilities such as museums, auditoriums, and conference halls, with images ready for projection as soon as the circuit-breaker on the switchboard is turned on. The VPL-FX41 has a built-in ID function, so each projector can be controlled independently from a single Remote Commander unit. For multi-projector installations in a single room, this feature is indispensable both during installation and operation. Vertical Keystone distortion of up to +/- 30 degrees can be digitally corrected via the OSD and/or Remote Commander unit of the VPL-FX41 projector. This enables detailed images to be projected with their correct geometry, even when installation space is limited.